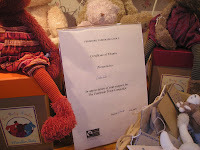 Oh, one other thing - I am really happy that Cottontails has received a certificate to say thank you for our role in helping Pershore to attain status as a Fairtrade Town. Last year - when I seemed to have a little more free time - I used to attend meetings of the Fairtrade committee, and even had a little stall at an open day where I sold some lovely bits and bobs made from fairly traded cotton and provided a few cakes made from fairly traded ingredients. I am so pleased that all the hard work has paid off and that Pershore has now been given fairtrade status. (Well, I say 'hard work' - the truth of it is I spent most of the open day taking part in a 'can you tell the difference?' fair trade chocolate taste test! And yes I could tell the difference - if you have yet to buy and try the Divine brand of chocolate, do so as soon as possible - it is gorgeous!). I know how you feel I had so much planned for yesterday and only got half of it done. I would love to do the taste test, yum, yum, I hope you get some more done today. Hope it goes better today Charlotte, you know what they say - aim for the moon and you should reach the stars! Well done on the fairtrade thing, Salisbury was awarded it last year too (not that I can claim any credit!). Everyday is like this for me! I think I set myself unrealistic targets, I feel like I have to save the world in 2 hours sometimes! It will all get done, eventually!